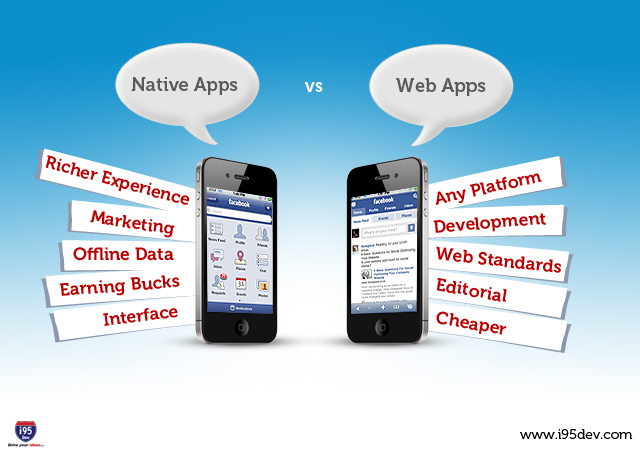 Native Apps and Web Apps – Which is Better? Mobile apps are the way of doing business today and a constant source of ingenuity for designers and developers. Searching for the perfect way to entice customers and make them want to engage in a company’s apps all come down to their accessibility. What is best for one company might not be the best for another. Each company needs to determine whether they want a web app, native app or both for their company. The premise behind both versions of your company’s app is the same; customers want a fluid experience, no matter where they encounter your company. Native applications are those that are specific to a certain platform, either Android, Apple, Kindle or any other platform. They only work on the platform for which they were created. As a company, you can charge money for these applications, which consumers are typically willing to spend. If you wish to have your application available on more than one platform, you will have to have an app created for each platform. The largest benefit of native apps is the rich experience it provides to users; however, it is a more costly endeavor than the web application. A web application, on the other hand, works universally on any platform, is easy to use and is built from standard technology, such as HTML 5 or CSS3. Typically web apps do not crash and offer a broad experience for the user. Any user on any platform can run your web app and it will look basically the same on all browsers. Web apps are much less expensive to create and maintain than native apps as well. The native app and web app are both good choices for companies; Determining which one is right for your company is essential. If your goal is to make money off your application, the native app is the right choice because you can charge users to download it. If simple content and user-friendly features are your goal, a web app might be more suitable. Your decision lies in your business objectives and technological experience, as well as the desires of your target audience.